Gaye Jurisich graduated with a Diploma of Teaching from University of Waikato School of Education. Her practice has focused on developing site-specific works for outdoor environments. She has works in public and private collections in the United States, Britain and New Zealand. Jurisich was awarded the 2006 Temporary Sculpture Commission at Connells Bay. She created The Long Lei, a spectacular addition to the Connells Bay collection during the summer of 2006/2007. 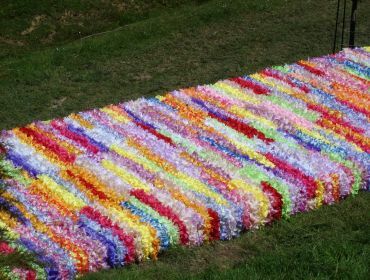 In making this temporary installation piece, Gaye Jurisich used over 3000 lei of brightly coloured artificial flowers. Each lei was individually hand-wrapped around chicken wire on a long wooden frame. Out of these she created a huge temporary flower bed, 14 metres long, 2.3 metres wide.